The first official photographs of Prince George have been released. 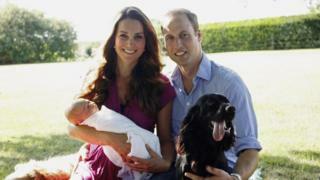 The baby - who is third in line to the British throne - is pictured with his parents, the Duke and Duchess of Cambridge. The pictures were taken by the duchess's father, Michael Middleton, in the garden of their family home in Bucklebury, Berkshire. Taken earlier this month, they show the royal couple, Prince George and their black cocker spaniel, Lupo. Tilly, a golden retriever belonging to the Middleton family, can be seen lying down behind them. The photographs of Prince George, who was born on 22 July, were released by Kensington Palace. On Monday Prince William, giving his first interview since becoming a father, told CNN: "He's a little bit of a rascal, I'll put it that way. "He either reminds me of my brother or me when I was younger, I'm not sure - but he's doing very well at the moment." Media captionPhotographer Terry O'Neill: "I found them quite charming - it is one of the hardest pictures to do"
BBC royal correspondent Nicholas Witchell said the new family look "unselfconscious, relaxed and happy - much like most couples might look with their first-born baby". He added: "Of course they're aware of what's expected of them. There will be staff - a nanny - to help in due course, but for the moment it's all rather informal and many might think, refreshing." Renowned photographer Terry O'Neill said he thought the pictures were "absolutely charming". "It reminded me when I first started photography for myself - I just went for the light, and it was really interesting lighting. As a matter of fact when I heard about these pictures, I thought 'Who have they got to do these pictures' - and the thought crossed my mind they might have asked the Queen because she's quite a good photographer - I thought that would be one up to the paparazzi." The cultural and education manager of Magnum Photos, Fiona Rogers, told Radio 4's Today programme the photograph of the couple and Prince George with the family's dogs was "technically not the most accomplished photograph". "It's a photograph that any one of us could have in our family albums," she said.